During OneBeat 2012, Senegalese MC Paul Pissety Sagna (aka PPS) was deeply inspired by his experience visiting Words, Beats, & Life (WBL), a OneBeat tour partner organization based in Washington, DC that is dedicated to transforming individual lives and communities through hip hop & education. As PPS describes it, his hometown of Rufisque, Senegal has a strong music scene but no recording studio and very few outlets for training youth in music production. PPS immediately connected with WBL’s mission of education through hip hop. He developed his idea for Sunu Kaddu, a Rufisque-based recording studio and youth center, while working with WBL in Washington DC. PPS describes Sunu Kaddu as an “arts paradise for the community, dedicated to creation and education.” Led by PPS and a team of dedicated administrators, his vision is for Sunu Kaddu to be a premiere studio for the many talented artists based in Rufisque, young and old, as well as a respected recording destination for musicians around Senegal. The central mission of Sunu Kaddu will be to develop arts programming for young people in Rufisque, leading workshops in area schools and inviting young musicians and producers to train in the studio. 2012 OneBeat Fellow & singer-songwriter Vera Jonas tells us that her experience as a cultural ambassador encouraged her to re-examine the role of music in Hungarian society and inspired her to develop project ideas to address social and cultural issues in her country. Upon returning home, Vera was inspired to focus on ways that music can bridge the gaps between various ethnic groups in Hungary, with a particular focus on young Roma musicians. Her idea, called Street Studio Hungary, builds on one of Found Sound Nation’s models for music-based engagement, which Vera experienced during OneBeat. For this workshop, her team worked with a group of young Roma musicians based at the Snétberger Talent Centre and Found Sound Nation to learn the FSN Street Studio methodology, and then use the model to engage communities and collaboratively create music (in public squares, universities, music festivals, etc.) in a handful of cities across Hungary. In the same way Ms. Jonas experienced how OneBeat encouraged dialogue and engagement, she hopes that the introduction of the street studio model to young Roma musicians in Hungary will help facilitate understanding and awareness between the Roma community and other non-Roma Hungarians, and will spur more ideas for music-based engagement for young Roma participants. Led by 2014 Fellow Kyla-Rose Smith and dancer Hannah Loewenthal, Hear Be Dragons (HBD) is a community-based education and creative arts initiative that brings together young people to map the sonic landscape of their lives. This unique experiential education project investigates the ways in which sound and the urban environment influence our quality of life, our perception of history and memory, and our notions of identity, place and time. In March and April 2015, with generous support from the National Sawdust, Bertha Foundation, The Augustine Foundation and the US Consulate in South Africa, HBD began this series of workshops with young musicians, actors and dancers in the Cape Town township of Nyanga, followed by workshops with a group of students at the El Puente Leaders for Peach & Justice in south Williamsburg, Brooklyn. During the workshops, these two groups of participants exchanged the sounds and original music that emerged from their neighborhoods. Plans are currently in the works for continued exchange in June 2016 at National Sawdust, when three participants from Cape Town will visit Brooklyn and present their work. LADAMA is comprised of five alumni of OneBeat 2014 & 2013: Lara Klaus (Recife, Brazil), Daniela Serna (Bogota, Colombia), Maria Gonzalez (Barquisimento, Venezuela), Sara Lucas (Brooklyn, USA), and Aurora Nealand (New Orleans, USA). The project’s goal is to encourage women and girls to engage in the art and business of making music by focusing on personal projects in music, and ultimately to empower and reclaim creative ownership for women and adolescent girls. The team’s hope is that participants in the LaDaMa project will be inspired to seek positions as creative leaders and educators, encourage other girls and women to chart a course in life that challenges traditional gender roles, and express their humanity and social entrepreneurship in community building through music. LADAMA has performed and lead creative workshops in Brazil, Colombia, Venezuela. In spring 2016, the collective will convene in New York for a residency at National Sawdust, sharing their music with diverse audiences and creating original works with workshop participants. The project recently received grant support from the Alumni Exchange Innovation Fund, becoming the first arts-based project to be selected by this granting organization. 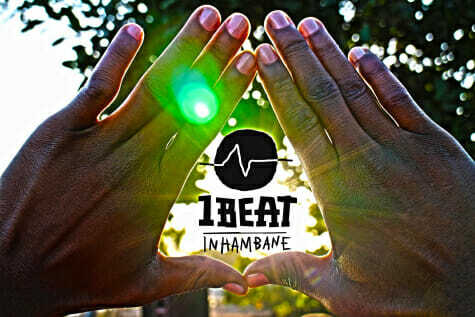 In the spring of 2014, OneBeat 2012 Fellow Helio Vanimal took cues from the OneBeat program model to launch 1Beat Inhambane in Mozambique, with support from the US Embassy in Maputo. Helio and his team selected 10 young professional musicians from a variety of musical backgrounds from around Inhambane to collaborate together on original recordings, perform, and conduct workshops. Led by a team of experienced Inhambane-based musicians, the groups performed at the Provincial and National Festivals in Mozambique, produced an album of original music, and continue to collaborate together today.